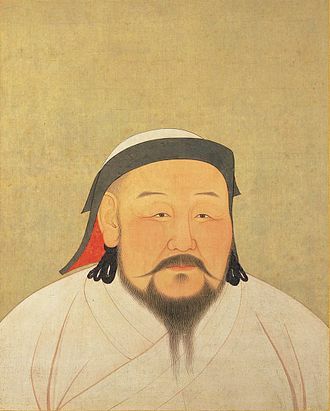 Today marks the 800th birthday (1215) of the great Mongol emperor Kublai Khan, grandson of Genghis Khan. 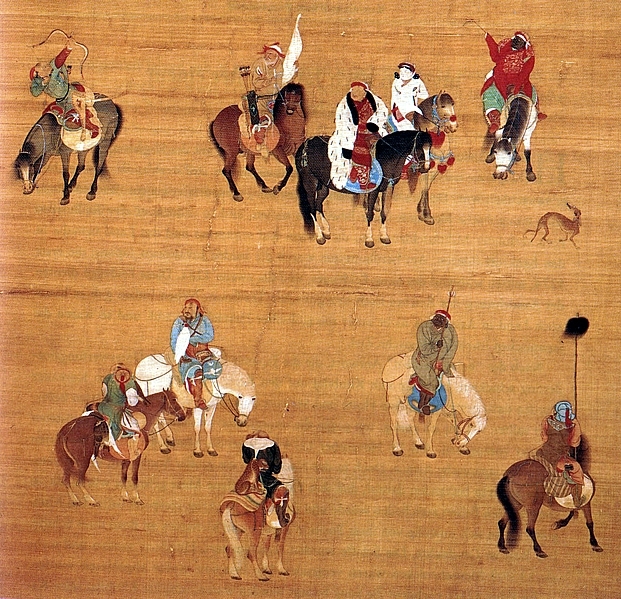 Under Kublai Khan with the conquest of China, the Mongol empire reached its greatest extent. I’m slightly torn about celebrating this anniversary because Kublai was one of the most ruthless, cruel, and brutal leaders in world history, a fact I am rather reluctant to honor. On the other hand, there is no denying the splendor of his rule and the lasting impact of his empire, especially in China. His birth is not being celebrated here in China because of a government policy of ethnic unity which obviates celebrating the Mongols and their legacy, important though it is to the history of China. I thought perhaps it would be best to talk about Xanadu, or Shangdu, the capital of Kublai Khan’s Yuan dynasty until he moved his capital to what is now Beijing. Xanadu remained his summer capital, noted for its opulence which was described by many authors. Xanadu is located in what is now called Inner Mongolia, 350 kilometers (220 mi) north of Beijing. The old city is roughly square shaped with sides of about 2,200 m. It consists of an “outer city”, and an “inner city” which is also roughly a square layout with sides of about 1,400 m. The inner city contains Kublai Khan’s palace with sides of roughly 550 m and covering an area of around 40% the size of the Forbidden City in Beijing. The most visible modern-day remnants are the earthen walls though there is also a ground-level, circular brick platform in the center of the inner enclosure. The city, originally named Kaiping (开平, Kāipíng), was designed by Chinese architect Liu Bingzhong from 1252 to 1256. In 1264 it was renamed Shangdu. At its zenith, over 100,000 people lived within its walls. In 1872, Steven Bushell, affiliated with the British Legation in Beijing, visited the site and reported that remains of temples, blocks of marble, and tiles were still to be found there. By the 1990s, all these artifacts were completely gone, most likely collected by the inhabitants of the nearby town of Dolon Nor to construct their houses. The artwork is still seen in the walls of some Dolon Nor buildings. Today, only ruins remain, surrounded by a grassy mound that was once the city walls. Since 2002, a restoration effort has been undertaken and in June 2012, Shangdu was made a World Heritage Site. 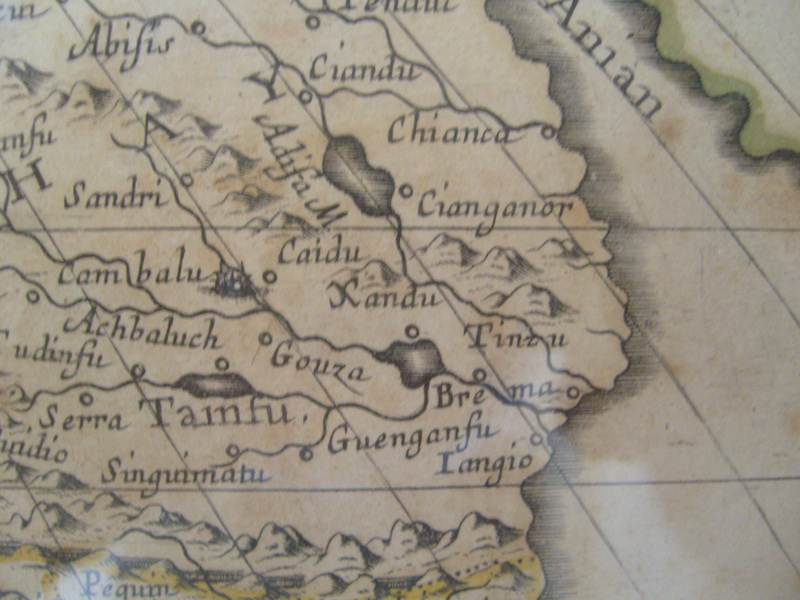 In Xandu did Cublai Can build a stately Pallace, encompassing sixteen miles of plaine ground with a wall, wherein are fertile Meddowes, pleasant Springs, delightfull streames, and all sorts of beasts of chase and game, and in the middest thereof a sumpuous house of pleasure, which may be moved from place to place. 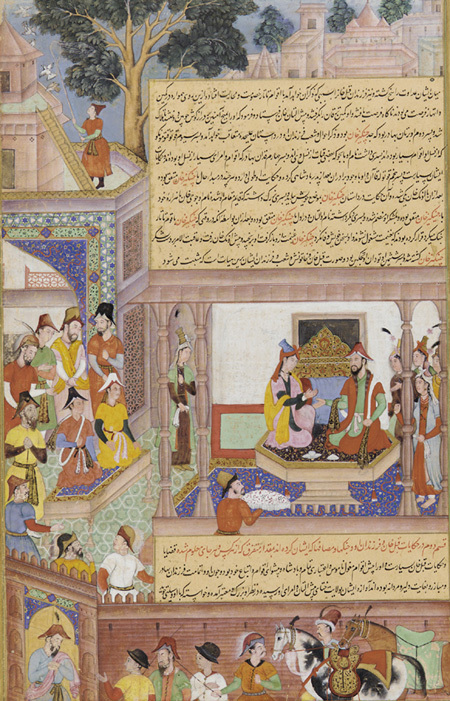 In 1797, according to his own account, the English poet Samuel Taylor Coleridge was reading about Shangdu in Purchas his Pilgrimes, fell asleep, and had an opium-inspired dream. 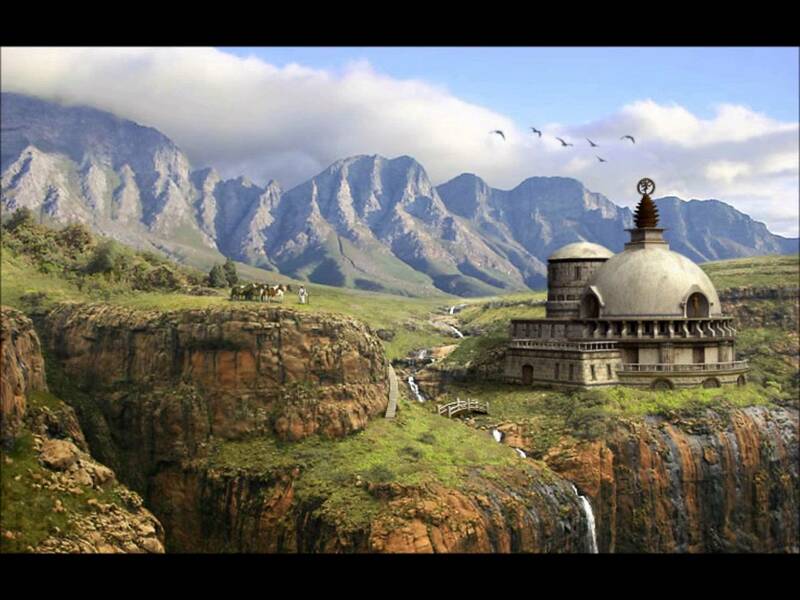 The dream caused him to begin the poem known as ‘Kubla Khan’. Unfortunately Coleridge’s writing was interrupted by an unnamed “man from Porlock” (a nearby village), causing him to forget much of the dream. But his images of Shangdu form one of the best-known poems in the English language. As a small aside, I was once, decades ago, baffled by a clue in The Times crossword – “sacred flower (4)” – for which I had _L_H. Cunningly tricky (short clues always are) !! Next day when I looked up the answer I kicked myself mightily. The word “flower” was not pronounced as if it were a blossom, but as a thing which “flows” – that is, a river. Grrrr. How could I have missed that? 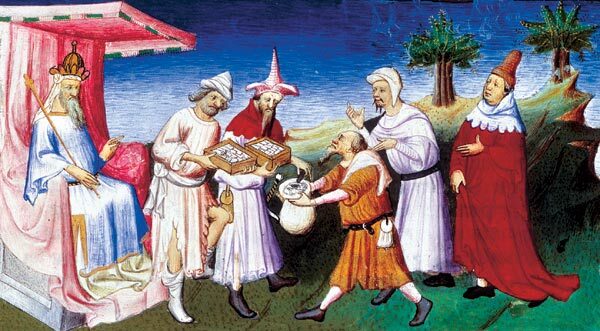 Kublai Khan must have had great banquets in Xanadu, but we do not have extant recipes. Instead I turn to a famous Mongolian dish, khorkhog. Khorkhog is made by cooking pieces of meat inside a container which also contains hot stones and water, and is often also heated from the outside. 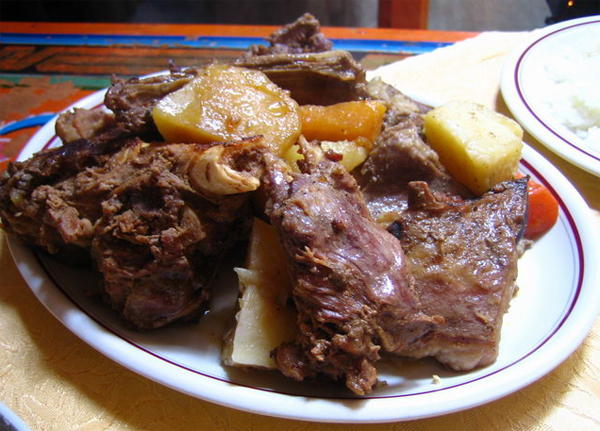 To make khorkhog, Mongolians take lamb, mutton or goat meat, and cut it into pieces of convenient size, leaving the bone in. Then the cook puts ten to twenty fist-sized rocks in a fire. When the rocks are hot they are placed with the meat and vegetables plus water in a cooking container such as a metal milk jug. The ingredients should be layered, with the vegetables (carrots, potatoes, and cabbage) on top. The container is capped tightly and placed in a bed of coals for around 90 minutes. When finished, the cook hands out portions of meat along with the hot stones which are tossed from hand to hand and are said to have beneficial properties. Diners usually eat khorkhog with their fingers, although one can use a knife to slice the meat off the bone. Khorkhog is a popular dish in the Mongolian countryside, but usually is not served in restaurants. Here’s an entertaining tourist video which will challenge your linguistic skills. The titles and most of the dialog are in Russian but you’ll catch some Mongolian as well. Makes me wish (very briefly) that my job prospects in Inner Mongolia had panned out.